Maple Glazed Turkey Bacon. 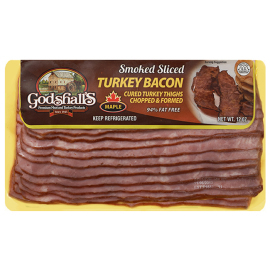 A Great Breakfast meat with less fat. A healthy low-fat breakfast entree with an old-fashioned smoked flavor. It's 94% fat free and lower in sodium and cholesterol than competing brands! Depending on time in transit, this item may require air service shipping.